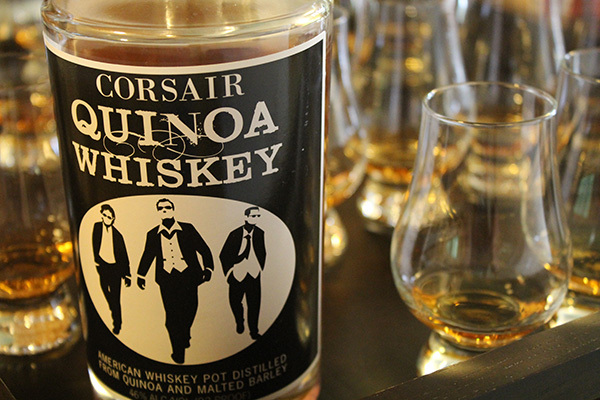 I’ve said it once and I’ll say it again, I’m constantly intrigued by “non-traditional” grain bills used in whiskey and the Corsair Quinoa Whiskey is no exception. If you’re not familiar with Quinoa (I wasn’t either) it is South American grain-like crop usually grown for it’s edible seeds. Other than using it for whiskey, Quinoa seeds can be cooked similar to rice and are served in a variety of dishes today. Although there are 3 colors of Quinoa (red, white and black), Corsair’s blend only uses the Red and White Quinoa grains. This Quinoa based spirit has earned a Silver at the 2011 New York International Spirits Competition and a Bronze, 2012 American Distillers Institute Awards and as far as I know it is the only Quinoa based whiskey on the market today. Now that we have all enjoyed a lesson in horticulture, how did it taste? Nose: Pleasant and strong, revealing a handful of scents including something sweet and nutty with hints of wood / hay. It really reminds me of a single malt scotch with a little something extra. Finish: Long and smooth with a warm lingering aftertaste of wood and wine. White Dog, White Lightning, Moonshine – it seems like everyone is making some sort of clear whiskey and Kansas Clean Distilled Whiskey seems to be one of the more “interesting” on the market. 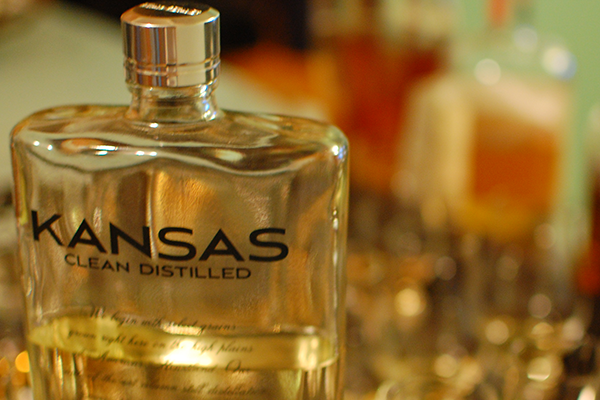 You see Kansas Clean Distilled Whiskey is only whiskey because it falls into the “Spirit Whiskey” category. A Spirit Whiskey (as I understand it) is a blend of 5% whiskey and 95% grain neutral spirit (GNS) otherwise known as Vodka. From what I’ve read, Spirit Whiskey was popular after Prohibition because there was so little whiskey in stock that producers tried to stretch it out by adding only a bit of aged whiskey to their large amounts of grain spirit. While this lasted for some time, eventually the two spirits went back to being properly produced and sold separately. The site and the marketing behind this product is done by Fabulous American Beverages (FAB for short) continues to poke fun at everyone who doesn’t resemble someone out of a stock art image search for “trendy hipsters”. Especially at those who came before us and pioneered the whiskey culture to make it what it is today. One of the interviews I read online with the founder Paul Goldman had this quote about why he decided to pursue this product “I was in London at a bar with my wife. She ordered a vodka drink and I suggested she be more daring and order a whiskey. She replied that whiskey was for old men and it wasn’t cool. That was my call to action.” Personally, I don’t order drinks based on what I think would look cool – but hey, everything about their marketing is centered on looking “cool”. It leaves us with a spirit company making fun of traditional whiskey culture all while trying to leverage the name, history and popularity to be included in a genre of spirits enjoyed around the world in hopes to sell a few bottles of ever so slightly “whiskey flavored” Vodka. If they were to take the word “whiskey” off the bottle they might just have a viable product that people would buy to make cocktails – a kind of “I don’t care what alcohol you use just as long as I get tipsy and don’t taste the booze” type of drinker’s dream drink. However, for $30ish dollars I imagine that most bartenders or home bars would just stick to their favorite mixing vodka and save some money. In regards to the taste, it tastes similar to a locally made Vanilla Bean Vodka I recently tried but nothing like whiskey. My favorite quote from a recent whiskey tasting was that this was a “sorority whiskey” and that my friends is all you need to know. Nose: Faint sweetness but extremely light. Finish: Long and Sweet like you just had a Werther's candy. Does aging great bourbon take time? Most of us would agree and emphatically say yes but the question is how much time? 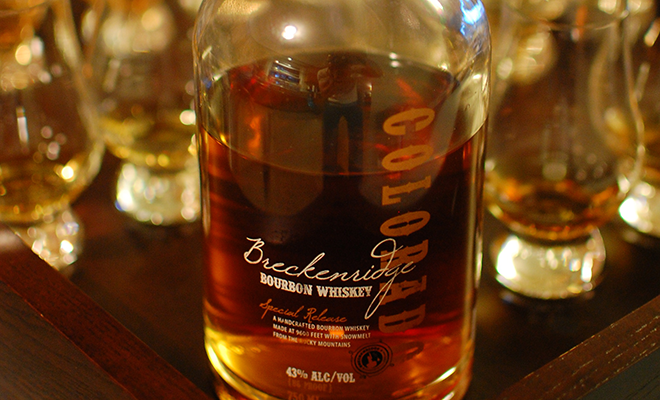 This bottle of Breckenridge Bourbon up for review is definitely one of the youngest – aged for only 2-3 years! I can hear some of you asking “How can this be any good when major players like Jefferson’s are releasing bourbon aged for over 21 years”? My only answer, taste it. I’m not stating that there aren’t amazing older Bourbons on the market, I’m just saying that we should continue to try some of these younger whiskeys from upstart craft distillers. The Breckenridge Bourbon has been making quite a name for itself by winning various accolades including 1 of only 3 Gold’s handed out for Bourbon at the 2011 International Wine & Spirit Competition. Owner Bryan Nolt (a self proclaimed Rye and Barley Whisky fanatic) and Master Distiller Jordan Via (an instructor at the American Distilling institute) say the great taste comes from using a unique mash bill of 38% rye, 56% corn and 6% un-malted barley – mixing in Rocky Mountain snow-melt from the glaciers atop Mt. Quandary and a utilizing a traditional open-top Scottish fermenter before distilling in a traditional copper pot still. They state that the snow-melt “provides pristine water with a unique ph balance which lends a distinctive flavor and texture”. Whatever the magic is they use to make this juice, I am a fan. As you can already tell, I am really enjoying this Bourbon and it was a real hit at this month’s whiskey tasting against some quality whiskeys. I hate to beat the “price-drum” again but I felt like $45 bucks was a bit high considering I had to pay for shipping on top of that. Hopefully they continue to gain fans and can increase production a bit to bring the down the price. I’d also be VERY curious to see if they have any plans on experimenting with a longer aged product in the future. To learn a bit more about how this great Bourbon came to be, you can read a short version of Bryan’s manifesto here. Color: Dark in the bottle, light honey in the glass. Nose: Sweet and citrusy with corn throughout. Finish: Medium, Warm and Sweet. It’s not easy being an American Whiskey & Bourbon fan attempting to tiptoe into the diverse world of Scotch. The prices tend to be higher, the flavors unique and the selections broader. I try Scotches on occasion but have yet to find a bottle that I would prefer over something out of my whiskey collection…until a friend recently recommended the Balvenie DoubleWood. I was hesitant but the rumors about this being a “gateway” Scotch for Bourbon fans really made me curious. 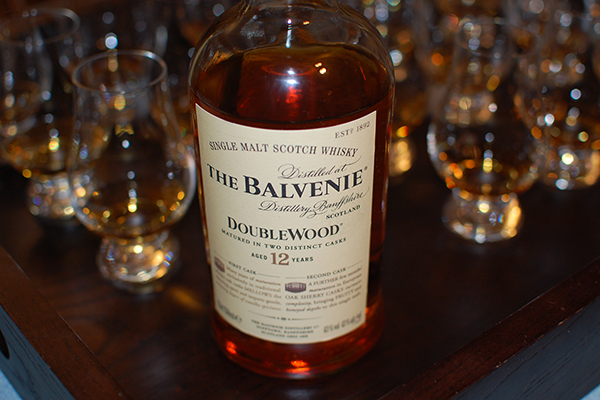 You see, the Balvenie DoubleWood is a Single Malt Scotch that spends its time aging in 2 very different woods (hence the name). It starts out in traditional Oak Whiskey Casks then is moved into European First Fill Sherry Casks to finish. The Oak Barrels smooth the rough edges and the time spent finishing in Sherry casks allows the whisky to absorb a large amount of sweet / tart flavors making a really intriguing combination. The distillery is located in Dufftown on Speyside, in Scotland and claim to be the only (and last) Single Malt Scotch Distillery to grow their own barley and use a traditional malting floor in the Scottish Highlands. Balvenie also mentions that their whisky has such a great taste because of a process they utilize referred to as “sweetening the still” where they boil juniper branches when breaking in new stills. This is a fun Scotch to drink and wasn’t what I was expecting out of a Scotch Whisky. It’s relatively moderate in price ($47 dollars) and at only 80 Proof can be sipped without the addition of ice or water. While it’s not the first bottle I would reach for in my cabinet it has definitely earned it’s place as a staple in my collection and has helped me reconsider the place Scotch has in my life. Nose: Sweet, sweet, sweet. Sherry and cherries, almost like a tart cough syrup. Finish: Warm, sweet and medium in length. I have a long-standing love for Rye whiskey, for those of you who know me well you have probably had to endure a longstanding Rye Whiskey phase where it was basically all that I purchased for my home bar. For the last year or so I have tried to steer clear of buying any Ryes until I couldn’t ignore the buzz swirling around about Masterson’s and WhistlePig. 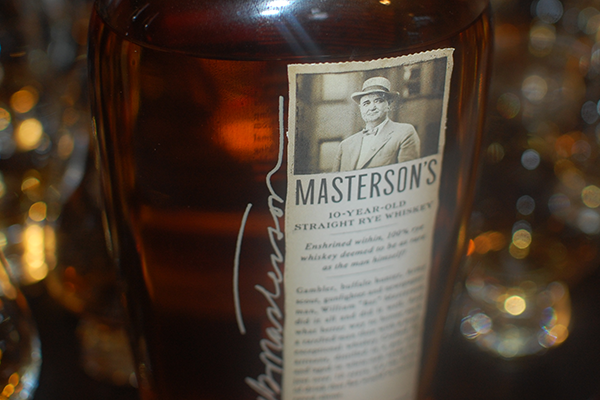 In this review I will be focusing on one of my new favorites, Masterson’s Rye Whiskey. This delightful whiskey is actually sourced from Alberta Distillers Limited in Calgary, Alberta Canada and made of 100% Rye using Glacial Water from the Northern Rockies, made in an old-fashioned pot still and although it comes out of the barrel at 125 Proof it’s tempered down to a reasonable 90 Proof. You might have heard the rumors that this distillery also produces WhistlePig and Jeffersons (a rumor that I can neither confirm nor deny) but having tasted all 3 whiskeys I would argue that they are each unique and not copy cat recipes. Take note that making 100% Rye isn’t easy, using all Rye is notoriously difficult to do because the grain is more expensive, and is extremely sticky making it rough on machinery to process. I’ve heard that the secret to their success with the all Rye recipe is due in part to using a yeast-like fungus in the distillation process. After 10 long years aging the whiskey is then shipped and bottled in Sonoma, California by 35 Maple Street (a Division of the Other Guys) owned by siblings Mia and August Sebastiani whose family is a well known and long time wine making family. This new division is now focused on making spirits including a Gin and Rum. There is also mention of an eventual Small Batch Bourbon production but I couldn’t find any information on it. While I know that I’ve shared some less than positive remarks about Canadian Whiskey in earlier articles, Masterson’s Rye Whiskey is fantastic and a definite favorite at the whiskey tastings I hosted in March. The only negative press that I noticed and that folks in my circles mentioned was regarding the price ($70 and up). I am usually one of the first people to raise the bar for a raised price tag but for me the quality of this spirit backed up the price. Nose: A wide variety of aromas. Crisp, bright and floral notes matched by a nice amount of wood, mint and spices. Finish: Long and warm finish with a good amount of spice. It’s new, it’s mysterious and it’s causing quite the ruckus in the whiskey community. 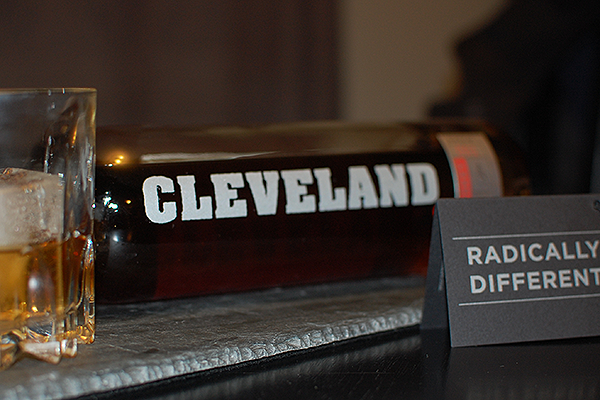 Introducing the latest Ohio based Bourbon – Cleveland Whiskey’s Black Reserve Bourbon. By definition this new spirit meets the technical standards to be called Bourbon but that’s about the only thing standard about their secret process. I’ve written earlier articles explaining the regulations and nuances of what differentiates bourbon from whiskey and throughout some of my reviews touched on some of the more interesting grains and their distilling process but the new Black Reserve Bourbon by Cleveland Whiskey is by far the most interesting process I have come across. For starters, this whiskey isn’t being made on a country farm but produced in a start-up incubator run by MAGNET (Manufacturing and Advocacy Growth Network) near Cleveland State University by entrepreneur Tom Lix and his six-person team. This small but mighty team is using a patent-pending process of “pressure aging” where a machine rapidly pushes alcohol (either their home made “white lightning” or sourced 6 month bourbon they purchase) in and out of used and charred barrel staves. This unique process aims to replicate the standard aging process that normally takes place when whiskey is placed in the cask but at an expeditious rate. They claim that this secret process can “produce a bottle in under a week that can compare to a 10 or 12 year old version”. You can hear more about this process from Tom Lix himself in this video from Fox 8 News. I’m torn on what to say about the Black Reserve Bourbon by Cleveland Whiskey… I’m a huge advocate for craft distillers (especially those in Ohio), it’s reasonably priced ($35.00) and I applaud their use of a new process in order to push the industry for innovation but at the end of the day the focus should be on the taste and not the marketing. While I’m curious to see what the future holds for this upstart craft distiller this initial release didn’t live up to their claims of being comparable to a 10 or 12 year Bourbon already on the market. I’m not saying don’t purchase a glass or a bottle. I’m suggesting going in with your expectations focused on purchasing it as a novelty whiskey or to support something locally made by a small group of enthusiasts. Color: Dark in the bottle, deep golden amber in the glass. Nose: Subtle sweetness, corn but heavy on the alcohol. No stand out notes. Finish: Hot, spicy and long, oak shows up once the heat subsides. 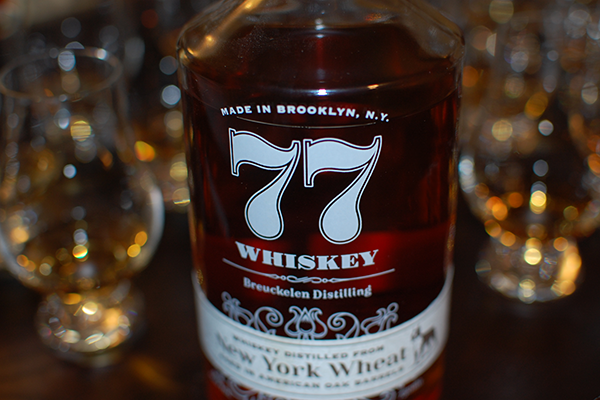 By now you should know that I’m a sucker for single grain whiskeys so of course my interest was peaked when I learned of this 100% Wheat Whiskey by Breuckelen Distilling. Like a lot of craft distillers this is a small operation and everything from milling the grains to the bottling takes place in their one room facility. All of the Ingredients are from locally produced sources (organic if possible). They even mention buying most of their supplies from a farmer name “Thor”. • Aged in new charred oak barrels. • Company also makes a gin and another whiskey expression. • Aged a minimum of 4 months. • 77 Whiskey was formerly named “Black Wax”. To be candid, I absolutely loved this whiskey. Punchy, upfront flavors and spices tempered by just enough sweetness to make this a nice sipping whiskey with an ice cube or two. I was also very pleased that they used some sort of string or floss to wrap inside of the wax that left just enough of a tail to make it extremely easy to open (other craft whiskey makers take note). You can learn a little more from this very cool video produced by the guys at “It’s Made By Hand”. I would be very curious to see what this would be like with a few extra years in the barrel but am happy to drink and recommend it as is. Color: Copper / honey / amber. Nose: Bright, sweet and fruity. Finish: Medium finish with upfront spice and oak fading into the sweetness. The finish and palate are very similar in their order of appearance. I can’t remember exactly where I first heard about Few Spirits Bourbon but I do know that this bottle has been popping up on everyone’s radar the past few months. 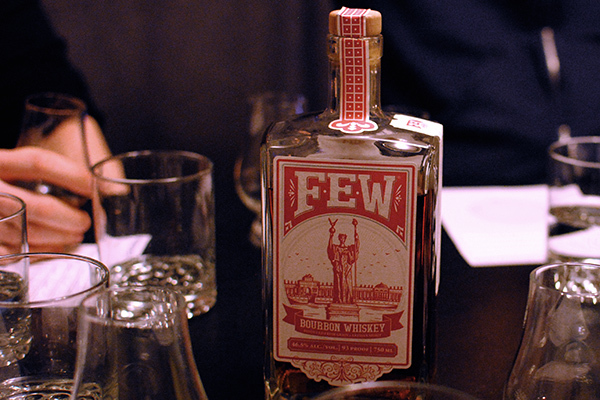 Maybe it’s the unique bottle and label design (which pays homage to the Chicago World’s Fair of 1893) or their claim to be the 1st licensed distillery since Prohibition in Evanston, Illinois that perpetuate this new bourbon’s allure and continued buzz around all of Few Spirits products. The Bourbon is one of 3 Whiskey products including a White Whiskey and Rye Whiskey completing the trio. The Bourbon is a 3 Grain Recipe using Corn, Rye and Barley and is aged less than 4 years in new charred oak barrels. It comes in at 93 Proof and retails for around $50 bucks. I’d have to say that I’m really rooting for the guys over at Few Spirits. They are extremely friendly, have put together a nicely packaged product and are off to a great start. While I do think it’s a solid new product, I think it could have used some more time in the barrel to smooth out the flavor profile. While it’s certainly better than some of the other start-up bourbons, I was expecting something smoother at the $50 price point. Good bourbon takes time and I’m sure the recipe will continue to be refined and hopefully more of those 4-year-old barrels will be used in future batches, which will only help take this bottle to the next level. I’ll definitely be keeping on eye of this bourbon to see where things go in the future. Color: Medium amber with a subtle red hue. Nose: Light and sweet, hints of corn and vanilla. Finish: Although slightly bitter, it has a nice lingering spice flavor similar to cinnamon. Confession… My experience with Irish Whiskey doesn’t expand much further then faded memories of an old friend that liked to order shots of Jamison at the bar and enjoying a few nice Jamison and Ginger Ales during the warm summer evenings. Basically, it hasn’t seemed commonplace to order up an Irish Whiskey on it’s merits of taste alone. That being said, I wanted to mix things up during last month’s WWR Whiskey Tasting and had run across a few positive comments on other blogs regarding Redbreast Irish Whiskey. Fortunately my favorite local liquor store (Weiland’s Market) happens to carry the 12yr and it wasn’t terribly expensive (roughly $60 bucks). 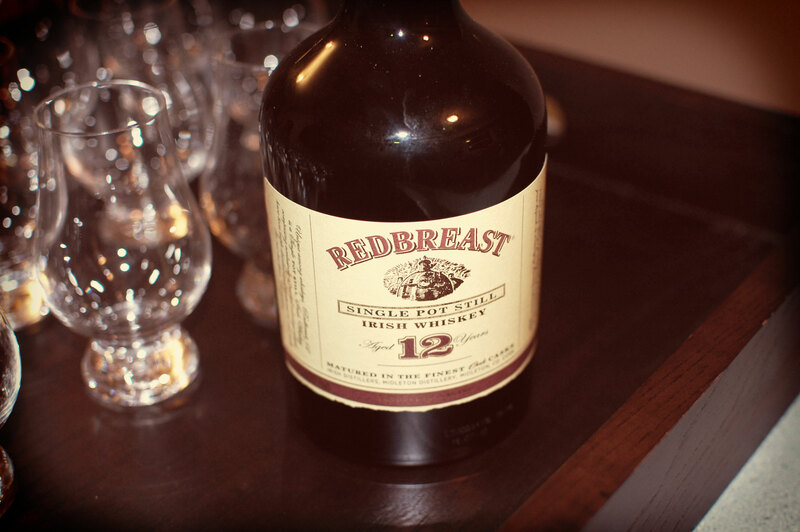 The Redbreast 12yr Whiskey comes in a green bottle and has vintage looking label so it’s a nice addition to my shelf. It’s non chill-filtered and distilled at the New Middleton Distillery in Cork, Ireland. It sets itself apart by being one of the few single pot still whiskey brands still being produced today. It should be noted that is also the only single pot still whiskey that has an age statement. Although a few years old, this whiskey has won a few awards including the top prize in its category at the World Whiskey Awards 2010, as well as being named the Irish Whiskey of the year by Jim Murray in the Whiskey Bible 2010, with a score of 96 points. I really enjoyed pairing this whiskey against some deeper flavored bourbon because it allowed me to really notice the enticing tastes that it had to offer. It has a light, floral, subtle flavor profile (similar to something from Canada) but was a nice change of pace. I definitely plan to explore the Irish Whiskey shelf a little further and all thanks to this enjoyable light Irish Whiskey from Redbreast. Nose: Fresh like something sweet, perfume, candy and fruit. Finish: Easy and floral but quick to fade. Made by Ransom Spirits in Sheridan Oregon this isn’t your everyday bottle of whiskey. Everything from the name of the distillery (a reference to the cost of being self-employed) to it’s production process that utilizes aspects of making bourbon, scotch, irish whiskey, and dutch corenwyn are a bit unconventional. 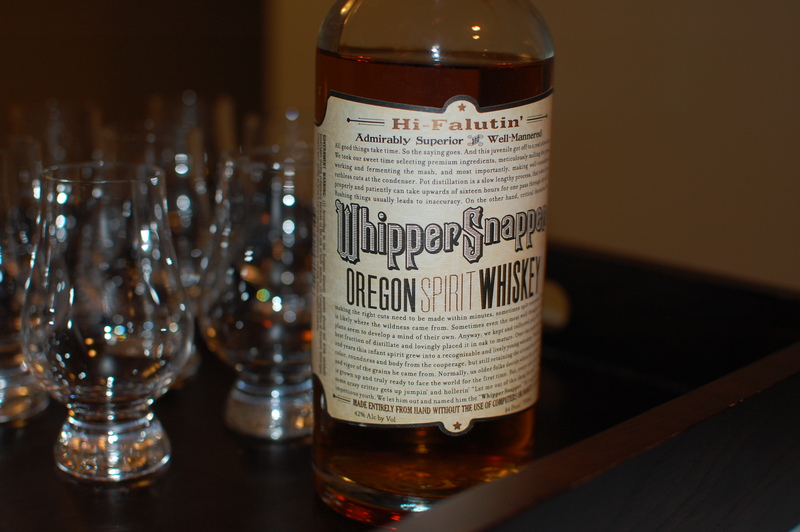 Whipper Snapper is made from 79% white dog and 21% malted barley, aged between six months to two years inside a variety of new and used whiskey barrels as well as Pinot Noir barrels which in my humble opinion is where things get interesting. The odd mixture creates a provocative taste that seems to leave you identifying a flavor that changes just as you start to figure it out… It’s a combination that you just can’t place. When the whiskey is ready only 8 barrels are selected, mixed and used for bottling which is done with extra tender love and care by being hand bottled, hand labeled, and hand waxed. All in all this isn’t a whiskey for traditionalist but I’m a sucker for something a little off the beaten path so I was happy to pick up a bottle to share with friends. Don’t let the overall rating fool you, it’s worth trying but for me it’s more of a novelty than a “must-have” item in your cabinet. Nose: Fruit, Beer and Barley. Finish: Warm but quick to fade leaving lingering hints of wine.